Baritone/Bass. Edited by Richard Walters. Vocal Collection. Opera, Classical. 246 pages. Published by G. Schirmer (HL.50484626). ISBN 0634044788. 9x12 inches. Edited by Richard Walters. 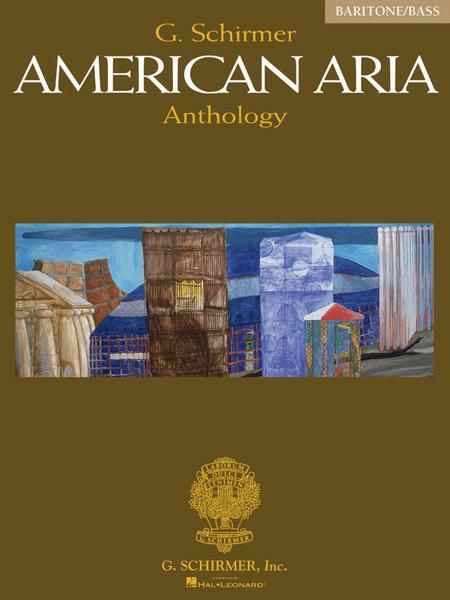 This landmark series, the first multi-volume aria anthology devoted entirely to the topic, collects compelling, useful, singer-friendly excerpts from the best of a distinctly American musical tradition. Plot notes and basic information about each opera are included. Opera composers such as Samuel Barber, William Bolcom, Douglas Moore, Virgil Thomson and Kurt Weill are represented. The operas of Gian Carlo Menotti are particularly present, with 26 arias from nine operas in the series. Contents: AMAHL AND THE NIGHT VISITORS: Oh, woman, you may keep the gold • ANTONY AND CLEOPATRA: Hark! the land bids me • THE BALLAD OF BABY DOE: Warm as the autumn light, Turn tail and run then, Good people of Leadville • CAROUSEL: Soliloquy • THE CONSUL: The Police Agent's Aria • THE EMPEROR JONES: Oh Lawd Jesus, heah my prayer • FOUR SAINTS IN THREE ACTS: Once in a while • THE GHOSTS OF VERSAILLES: They wish they could kill me, Figaro was supposed to return the necklace • THE GOOD SOLDIER SCHWEIK: The Doctor's Aria, Dear Madame • THE GREAT GATSBY: I remember long ago • A HAND OF BRIDGE: And this will be my epitaph JOHN BROWN: The Songs of the Slave • LITTLE WOMEN: There was a knight, Kennst du das Land (Do you know the land) • LOST IN THE STARS: Thousands of Miles, O Tixo, Tixo, help me! • McTEAGUE: Jehosophat! • THE MIGHTY CASEY: In 1839, The Catcher's Song, The Manager's Song, The Umpire's Song • THE MOTHER OF US ALL: What what is it, Angel More • THE OLD MAID AND THE THIEF: When the air sings of summer (Bob's Aria) • REGINA: Horace's Aria, Greedy Girl • THE SAINT OF BLEECKER STREET: Ah, poor Michele • SHOW BOAT: Ol' Man River • STREET SCENE: Let things be like they always was • SWEENEY TODD: Epiphany • TARTUFFE: Every day at church • TEA: Venus of the East • THE TEMPEST: Our revels now are ended • VANESSA: You rascal, you! I never knew you had a soul, For ev'ry love there is a last farewell • WUTHERING HEIGHTS: Man that is born of a woman.